INDUSTRY.co.id - Nusa Dua - The Indonesian Welding Association (API) as an organization that embraces welding industry in Indonesia has paved the way for young welders to become internationally certified professionals in two ways. Two paths provided by the API are through qualification and certification. Through the IIW Forum 2018 IIW Annual Assembly & International Conference (IIW Forum 2018), all the experts in the welding field of 49 members of IIW have made an agreement that all professionals who have been certified internationally will be accepted to work in any industrial company either domestically or overseas. This international certification is proof that the welding professionals are really qualified in the welding field. What's interesting about the IIW Forum 2018 is that qualification schemes can be integrated with formal education, whether at the formal education level such as Vocational High School or higher educational institutions. Currently, the International Institute of Welding (IIW) is making a discourse that the level of vocational schools can also get international diplomas and certificates. Meanwhile, for higher education level, the participants will get a higher level, such as Welding inspector and / or Welding Engineer, which will greatly assist the government in providing qualified and internationally qualified workforce. API also realizes that the realization of this plan will take time because it needs to change from the existing curriculum. In addition, one of the things that also concern is related to the ability of foreign language because the professionals mentioned above are required to master a foreign language to be accepted in foreign industries. The President of the Indonesian Welding Association (API), Achdiat Atmawinata, stated that there are several levels or professional welding staff from entry level international welder, international welding practitioner (supervisor welder), international welding inspector, international welding specialist, international welding technologist and the highest level is welding engineer. 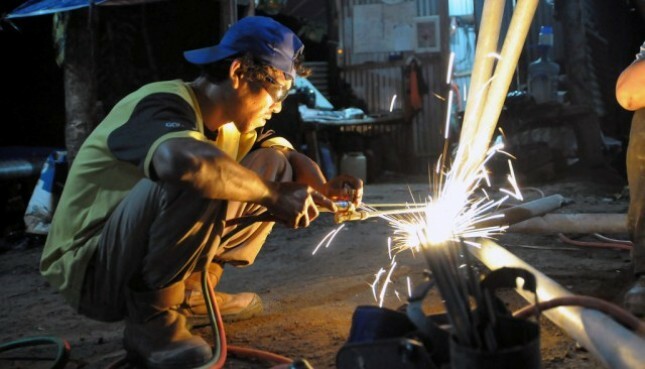 At this time it is estimated that the number of welder in Indonesia is in the range of more than 1,000,000 people while the number of welder engineer more than 1,500 people. "We encourage the Industries to provide space to these internationally certified professionals. Supported by competent and certified professionals, the products produced by the industry can have good quality, the quality of the company will also increase, market penetration can enter the international level, and so forth. This will certainly be an added value for the company. Therefore we emphasize the importance of improving the ability of these professionals to get to international certification. In the event IIW Forum 2018, we not only see the results of product-oriented but also see the process-oriented, "said Achdiat on the sidelines of The IIW II International Assembly & International Conference 2018 (IIW Forum2018) at Bali Nusa Dua Convention Center (BNDCC), Bali. Achdiat stated at this time actually there are many companies that employ professional welding workers especially companies whose products target the export market. However, he acknowledges that there are still companies that have not employed certified welding workers and only use ordinary welding power. He hopes that in the future more companies will participate by encouraging professional welders to undergo certification process to obtain international certification. It also supports the Ministry of Industry of the Republic of Indonesia, which continuously strives to hold certification programs to encourage the increase of the number of professionals as well as improve the competitiveness of human resources. "The implementation of IIW Forum 2018 is one of the API's efforts, with full support from International Institute of Welding (IIW), to improve the quality of welding power in Indonesia," he explained. Meanwhile, Chairman of the Organizational Committee of the International Institute of Welding (IIW) Forum 2018, Edi Diarman Djasman said that the IIW Forum 2018 event received tremendous response from both local and overseas welding communities. This is evident from the many participants who attended this event. "Up to now, we recorded 730 participants who are professionals from 47 countries who took part in the IIW Forum 2018 event," said Edi. He also stated IIW Forum 2018 will discuss and introduce the latest technological developments in the field of welding, including the use of laser technology. The latest technological developments in the welding world will be discussed in various conference sessions as well as through exhibitions held during the event. IIW Forum 2018 received full support from the Ministry of Industry of the Republic of Indonesia who participated hope the national welding industry can continue to grow. "The government supports the welding industry in Indonesia can continue to grow in order to support industrial progress in the country and play more at the international level," said Edi.